Filing status affects the federal tax rates. Upon the death of a U.S. taxpayer, the Internal Revenue Service immediately categorizes the deceased person's estate as a separate entity as far as income tax liability is concerned. For example, a taxpayer that dies on July 1 would have a personal income tax liability through June 30, and the estate would be liable for taxes from July 1 to the end of the tax year. However, a personal representative may choose the 12-month accounting period upon which the estate's tax liability is based once the entity becomes liable. The personal representative of the estate is sometimes officially called the administrator or the executor, depending on whether the person was appointed by the court or named in the decedent's will. Legally, it is the responsibility of the personal representative to file income tax returns for the decedent and the estate. 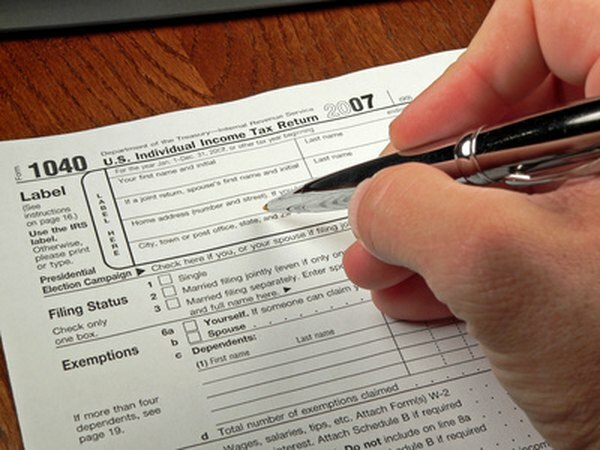 The personal representative files IRS Form 1041, Income Tax Return of an Estate. Even though you choose to file separate tax returns as a married individual, you may qualify for the joint tax rates if you file as qualifying widow(er) with dependent children. The benefits of this filing status allow you to claim your income separately from your deceased spouse and be taxed at a lower rate. To be eligible for this filing status you cannot remarry during the tax year, you must have a qualifying dependent child and provide more than one-half of the expenses of the child's residence during the tax year. In addition, you must have been legally eligible to file a joint return with your spouse if you had chosen to do so. If your official home residence is located in one of the states that have community property laws, you may be subject to different rules as to your overall tax liability. Community property states in 2012 were Arizona, California, Idaho, Louisiana, Nevada, New Mexico, Texas, Washington and Wisconsin. The IRS stipulates that couples who live in community property states may qualify for innocent spouse relief even if filing separate returns. If you have a history of filing separate returns during your married life and want to keep the final tax forms that way, the personal representative of your spouse's estate holds the responsibility for filing the final return. If you plan to file a joint return to reduce tax liability and your spouse died during the tax year for which you are filing, the personal representative of the estate has the authority to change this and file separately for your spouse. The personal representative holds authority to make this decision for up to one year from the due date of the tax return. This deadline includes an expanded window for extensions. Even if you have filed taxes in previous years separate from your spouse, it may benefit you to file under a different status for the tax year in which your spouse died. However, you will need to evaluate your present and past tax liabilities and compare. If you are not familiar or comfortable with filing your own taxes, a professional tax advisor can help you with this assessment, as situations vary by personal financial circumstances.